Newly published data reveals some racial disparities in UCPD’s interactions with community members, but fails to account for how the police force deals with University of Chicago students. In the 10 months since the University of Chicago Police Department began publishing data on its daily contacts with community members, UCPD officers have stopped and questioned 166 people on foot. All but 11 of them were African-American. For community members and activists, the data provide greater evidence for longstanding claims that the private university police department engages in racial profiling. 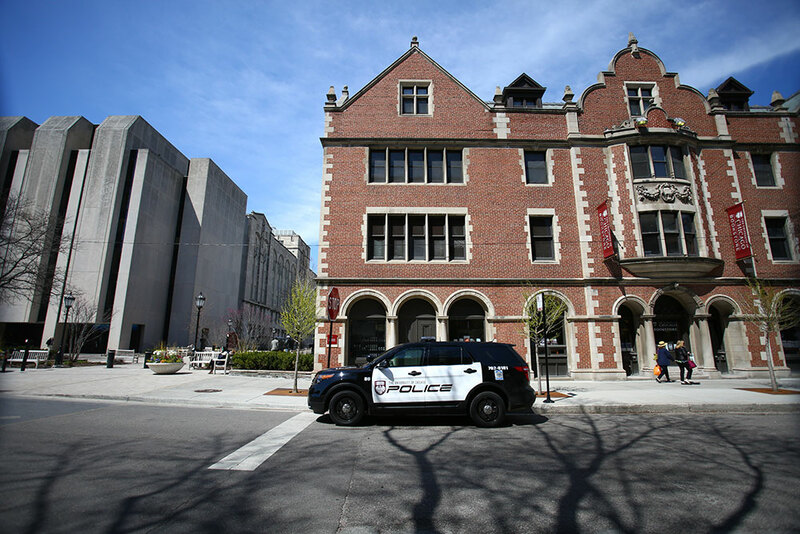 “I think it is definitive proof that there is some discrepancy in the way UCPD polices,” said Sofia Butnaru, a second-year student at U of C and co-coordinator of the Campaign for Equitable Policing, which has been calling for increased transparency and accountability from UCPD. UCPD Chief Fountain Walker countered that the data show his officers are primarily responding to community calls for service. “If you look at the number of interactions that we’re having in our area of 65,000 residents and another 40,000 (university) affiliates, I think we’re doing good work,” he said. An agreement with the City of Chicago allows UCPD to patrol a 3.5-square-mile area that extends far beyond the boundaries of U of C’s campus, from 65th Street to the south to 37th Street to the north, and from Cottage Grove Avenue to the West to Lake Shore Drive. Approximately 65,000 people live in this area, according to the latest Census data. African-Americans make up approximately 59 percent of the population in UCPD’s patrol area but 93 percent of UCPD’s field interviews, as the investigatory stops are called when the person is on foot. Black residents of the neighborhoods surrounding Hyde Park have long contended that UCPD engages in racial profiling. Jawanza Malone, executive director of the Kenwood Oakland Community Organization, said he has been stopped or followed multiple times by UCPD over the years. Once, shortly after he moved to the area about 20 years ago, a UCPD officer pulled over his car as he and a co-worker were leaving a friend’s house, he said. The officer said they matched the description of suspects in a break-in. Malone said he believes that the stop was racially motivated. Brandy Parker, 20, who grew up near the university and lived in the neighborhood until last winter, said he had his first encounter with university police when he was 14. He and some friends were hanging out on the Midway Plaisance, the wide parkway that connects Washington Park and Jackson Park, near Ellis Avenue, when a UCPD officer came by. “He said, ‘Ya’ll don’t belong over here,’” Parker said. By the time Parker moved from the neighborhood, he said, UCPD officers had stopped him so many times that they knew him by name. Like Parker and Malone, four out of every five people stopped by university police in field interviews since June 2015 have been black men, according to the university’s data. UCPD’s Chief Walker, himself a black man, acknowledged that accusations of racial profiling are part of UCPD’s past, but said the department has turned over a new leaf in its relationship with the community. He said he hasn’t heard any complaints from community members regarding field interviews since he took over the department in August 2015. He said the data, which show that two-thirds of investigatory stops are initiated by community members, rather than UCPD officers, reflect his personal commitment to policing that responds to the community’s needs. The university has also released data on traffic stops, which Walker noted show a drastic reduction in the number of drivers pulled over by UCPD officers, which was a response to community feedback. In 2014, UCPD officers made more than 500 traffic stops per month; since last June, university police have stopped just 102 drivers total. Nevertheless, more than 75 percent of the drivers stopped since June were African-American, and an additional 10 percent were Asian or Latino. About 64 percent of drivers in UCPD’s patrol area are minorities, according to data released by the Illinois Department of Transportation. The data released by the university are an incomplete accounting of UCPD’s activities. Crucially, they don’t include interactions with U of C’s 17,000 undergraduate and graduate students. Walker said incidents with students typically are referred to the dean’s office. That option is not available for community members who fall under UCPD’s jurisdiction. “The distinguishing factor is we know who our students are,” he said. But student activists said the fact that UCPD deals differently with students is problematic, because it leads to a two-tiered system of policing. A student and community member accused of the same infraction have two different outcomes: the former meets with the dean, the latter could land in jail. “It’s a known fact that, as students, they are definitely there to help us not get in trouble,” Butnaru said. As a private university police department, UCPD is not subject to state public records laws. That has been a major focus of student activists, who have been joined by public officials, including State Rep. Barbara Flynn-Currie (D-25th) and State Rep. Christian Mitchell (D-26th), in saying that UCPD and other private police departments like it should be accountable to the public. Last April the university announced it would begin releasing the limited data on field interviews and traffic stops. Soon after, a bill that would have made UCPD subject to state open records laws died in an Illinois Senate committee after passing unanimously in the House. Activists with the Campaign for Equitable Policing said that without legislation the university can continue to selectively withhold information. “If the UCPD polices 65,000 people, why isn’t [the department] subject to the Freedom of Information Act?” Butnaru asked. Walker said UCPD still has to work on building relationships with the community, which means continuing to work on transparency and overcoming past animosity. But he said he is optimistic. The race between candidates State Rep. Christian Mitchell and Jay Travis may hinge on their positions on Chicago schools. And you know this how? The UofC refuses to release information about the type of stops that incriminate its students (99% of whom are not black). Why don’t they release the info so we can see that a white male stopped by the UofC police is more likely to be committing a drug crime (possession of controlled substances like stimulants or intoxicated in public) than the many blacks that are stopped frivolously and released without charges. Heck if there’s nothing to worry about, why are young adults going to the dean rather than face their legal consequences — meanwhile there are black young adults who commit the same offences and get records (views must be nice from your perch huh Jeff Janulis).